Abstract: Chronic hepatitis C virus (HCV) infection is one of the most common etiologies of liver-related mortality throughout the world. Among the six HCV genotypes, genotype 1 was significantly more aggressive when utilizing the combination of pegylated interferon and ribavirin, as genotype 1-infected patients had the lowest likelihood of achieving cure (40%–50%) and required twice as long duration of treatment, as compared to genotypes 2 and 3. Recently, however, significant advances have been made with the advent of all-oral direct-acting antiviral agents, which have significantly improved the safety, efficacy, and tolerability of the treatment of HCV genotype 1. Among the available treatments for HCV genotype 1, the combination therapy of ledipasvir/sofosbuvir provides several advantages compared to other regimens, including use of a single-pill regimen, possibility to shorten the duration of treatment to 8 weeks, efficacy in patients exposed to protease inhibitors, safety in decompensated cirrhosis, and potential to avoid ribavirin. In this review, we discuss the pharmacotherapy of the combination of ledipasvir/sofosbuvir therapy and summarize the results of the Phase III clinical trials for this treatment in HCV genotype 1 patients. We will also discuss the data for special populations, including decompensated cirrhosis, human immunodeficiency virus (HIV) coinfected patients, African-Americans, the elderly, and those who failed sofosbuvir-containing regimens. In this article, we review the combination of LDV/SOF for treatment of HCV genotype 1, with a focus on data from Phase II and III studies, findings from real-world cohorts. We also discuss the safety and efficacy of LDV/SOF treatment for special patient populations. 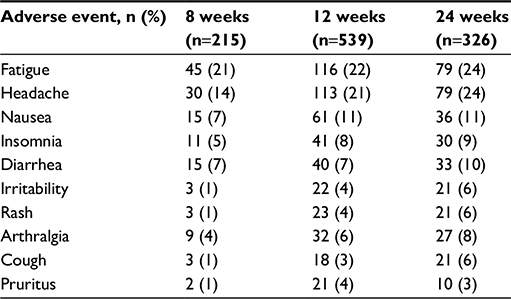 In the SIRUS trial, the efficacy of a 12-week course of LDV/SOF plus RBV (n=77) was compared to a 24-week course of LDV/SOF (n=78), in treatment-experienced patients with HCV genotype 1 infection and compensated cirrhosis who failed prior treatment with IFN-based therapy, which also utilized telaprevir or boceprevir.26 The SVR12 rates were 96% for patients in the LDV/SOF plus RBV group receiving 12 weeks of therapy and 97% in the LDF/SOF group treated for 24 weeks.26 This study suggests that in genotype 1 treatment-experienced patients with cirrhosis, a 12-week course of LDV/SOF plus RBV may provide a more cost-effective regimen with SVR12 rates similar to those receiving 24 weeks of LDV/SOF without RBV. In contrast, patients who failed regimens that included an NS5A inhibitor, including LDV/SOF, are likely to have resistance-associated variants to NS5A inhibitors, which can persist for years and reduce the efficacy with NS5A inhibitor therapy.29 In one study, of the 41 patients who previously failed LDV/SOF therapy for 8 or 12 weeks, 71% achieved SVR12 after retreatment with LDV and SOF for 24 weeks.29 SVR12 rates were lower in patients with baseline NS5A resistance-associated variants. Additionally, four patients with NS5A resistance-associated variants developed evidence of SOF resistance.29 These findings indicate that NS5A inhibitors, such as LDV, should not be reused in patients who harbor a resistant variant after prior treatment with these agents. LDV/SOF has been reported to be safe and well tolerated. Data regarding AEs comes primarily from the ION studies. The results from the ION trials confirmed the safety and tolerability of the LDV/SOF regimen both with and without RBV.33 Less than 1% of patients either receiving RBV or not discontinued treatment because of an AE. The most common side effects included headache, insomnia, irritability, rash, and fatigue. Treatment-related AE s occurred in 71% and 45% of patients treated with and without RBV, respectively. No patient deaths were reported and none of the study patients developed a hemoglobin level <9 g/dL during treatment.33 Details regarding the most commonly seen AEs with the use of LSV/SOF, as determined by an integrated safety analysis of the Phase III ION studies, are depicted in Table 1. Note: Alqahtani SA, Afdhal N, Zeuzem S, et al. Safety and tolerability of ledipasvir/sofosbuvir with and without ribavirin in patients with chronic hepatitis C virus genotype 1 infection: Analysis of phase III ION trials. Hepatology. 2015;62:25–30.33 With permission from John Wiley and Sons, copyright ©2015. Chronic HCV treatment has evolved dramatically over the last 5 years, with the advent of DAAs that directly target HCV replication, and the transition from IFN-based therapy to non-IFN-based all-oral treatment. HCV genotype 1, which was traditionally the most difficult to treat during the IFN era, can now be cured with all-oral therapy in as little as 8 weeks. There are several advantages to utilizing LDV/SOF therapy. First, this combination can be given for 8 weeks in certain patients as opposed to 12 weeks’ duration with other DAA-based therapy; shorter duration of therapy may not only be desirable for the patient but can also lead to reduced costs. Second, RBV has a potentially unfavorable side effect profile, which includes hemolytic anemia, rash, and teratogenicity. Finally, this regimen has proven safety and efficacy in otherwise difficult-to-treat patients, including those with decompensated cirrhosis and patients who have failed treatment using a protease inhibitor. There are still several unmet needs, primarily demonstration of safety in patients with renal failure. The goal of future therapy will be a regimen that is pan-genotypic and has near 100% efficacy in all patient groups. Additional reading for the practitioner includes practice guidelines published by the American Association for the Study of Liver Diseases/Infectious Disease Society of America.12 The website (www.hcvguidelines.org) for their recommendations is updated every 3 months to keep the clinician current with evolving data. Recommendations are centered on medications approved in the US. Hepatitis C practice guidelines are also provided by European Association for Study of the Liver (EASL)34 to guide the practitioner in Europe, as the regimens available in Europe may be different from those approved in the US. VS and KVK both contributed equally to conceptualization and study design, including literature search, and drafting and critical revision of the manuscript. Both authors are guarantors. All authors contributed toward data analysis, drafting and revising the paper and agree to be accountable for all aspects of the work. VS: Speaker’s bureau: Salix, Gilead, Abbvie, BMS, Intercept. Advisory board: Gilead, Abbvie, Janssen, BMS, Intercept. KVK: Grants/Research: Evidera, Gilead, Immuron, Intercept, Tobira. Advisory board: Abbvie, Achillion, BMS, Evidera, Gilead, Merck, Novartis, Trio Health. Consultant: Abbvie, Gilead. The authors report no other conflicts of interest in this work. Alter MJ, Kruszon-Moran D, Nainan OV, et al. The prevalence of hepatitis C virus infection in the United States, 1988 through 1994. N Engl J Med. 1999;341:556–562. Global Burden of Hepatitis CWG. Global burden of disease (GBD) for hepatitis C. J Clin Pharmacol. 2004;44:20–29. Hu KQ, Tong MJ. The long-term outcomes of patients with compensated hepatitis C virus-related cirrhosis and history of parenteral exposure in the United States. Hepatology. 1999;29:1311–1316. Cornberg M, Razavi HA, Alberti A, et al. A systematic review of hepatitis C virus epidemiology in Europe, Canada and Israel. Liver Int. 2011;31(Suppl 2):30–60. Fried MW, Shiffman ML, Reddy KR, et al. Peginterferon alfa-2a plus ribavirin for chronic hepatitis C virus infection. N Engl J Med. 2002;347:975–982. Ghany MG, Nelson DR, Strader DB, Thomas DL, Seeff LB; American Association for Study of Liver D. An update on treatment of genotype 1 chronic hepatitis C virus infection: 2011 practice guideline by the American Association for the Study of Liver Diseases. Hepatology. 2011;54:1433–1444. Sadler MD, Lee SS. Revolution in hepatitis C antiviral therapy. Br Med Bull. 2015;113:31–44. Herbst DA Jr, Reddy KR. Sofosbuvir, a nucleotide polymerase inhibitor, for the treatment of chronic hepatitis C virus infection. Expert Opin Investig Drugs. 2013;22:527–536. Jacobson IM, Gordon SC, Kowdley KV, et al. Sofosbuvir for hepatitis C genotype 2 or 3 in patients without treatment options. N Engl J Med. 2013;368:1867–1877. Lawitz E, Gane EJ. Sofosbuvir for previously untreated chronic hepatitis C infection. N Engl J Med. 2013;369:678–679. Zeuzem S, Dusheiko GM, Salupere R, et al. Sofosbuvir and ribavirin in HCV genotypes 2 and 3. N Engl J Med. 2014;370:1993–2001. AASLD/IDSA/IAS–USA. Recommendations for testing, managing, and treating hepatitis C. 2014. [Updated February 24, 2016]. Available from: http://hcvguidelines.org. Accessed March 19, 2016. Alqahtani S, Sulkowski M. Current and evolving treatments of genotype 1 hepatitis C virus. Gastroenterol Clin North Am 2015;44:825–843. Herbst DA, Reddy KR. NS5A inhibitor, daclatasvir, for the treatment of chronic hepatitis C virus infection. Expert Opin Investig Drugs. 2013;22:1337–1346. Gu M, Rice CM. Structures of hepatitis C virus nonstructural proteins required for replicase assembly and function. Curr Opin Virol. 2013;3:129–136. Tanji Y, Kaneko T, Satoh S, Shimotohno K. Phosphorylation of hepatitis C virus-encoded nonstructural protein NS5A. J Virol. 1995;69:3980–3986. Tellinghuisen TL, Marcotrigiano J, Gorbalenya AE, Rice CM. The NS5A protein of hepatitis C virus is a zinc metalloprotein. J Biol Chem. 2004;279:48576–48587. Appel N, Zayas M, Miller S, et al. Essential role of domain III of nonstructural protein 5A for hepatitis C virus infectious particle assembly. PLoS Pathog. 2008;4:e1000035. Tellinghuisen TL, Foss KL, Treadaway JC, Rice CM. Identification of residues required for RNA replication in domains II and III of the hepatitis C virus NS5A protein. J Virol. 2008;82:1073–1083. Bunchorntavakul C, Reddy KR. Review article: the efficacy and safety of daclatasvir in the treatment of chronic hepatitis C virus infection. Aliment Pharmacol Ther. 2015;42:258–272. Afdhal N, Zeuzem S, Kwo P, et al. Ledipasvir and sofosbuvir for untreated HCV genotype 1 infection. N Engl J Med. 2014;370:1889–1898. Afdhal N, Reddy KR, Nelson DR, et al. Ledipasvir and sofosbuvir for previously treated HCV genotype 1 infection. N Engl J Med. 2014;370:1483–1493. Kowdley KV, Gordon SC, Reddy KR, et al. Ledipasvir and sofosbuvir for 8 or 12 weeks for chronic HCV without cirrhosis. N Engl J Med. 2014;370:1879–1888. Charlton M, Everson GT, Flamm SL, et al. Ledipasvir and sofosbuvir plus ribavirin for treatment of HCV infection in patients with advanced liver disease. Gastroenterology. 2015;149:649–659. Manns M, Samuel D, Gane EJ, et al. Ledipasvir and sofosbuvir plus ribavirin in patients with genotype 1 or 4 hepatitis C virus infection and advanced liver disease: a multicentre, open-label, randomised, phase 2 trial. Lancet Infect Dis. 2016 Epub Feb 18. Bourliere M, Bronowicki JP, de Ledinghen V, et al. Ledipasvir-sofosbuvir with or without ribavirin to treat patients with HCV genotype 1 infection and cirrhosis non-responsive to previous protease-inhibitor therapy: a randomised, double-blind, phase 2 trial (SIRIUS). Lancet Infect Dis. 2015;15(4):397–404. Reddy KR, Bourliere M, Sulkowski M, et al. Ledipasvir and sofosbuvir in patients with genotype 1 hepatitis C virus infection and compensated cirrhosis: An integrated safety and efficacy analysis. Hepatology. 2015;62(1):79–86. Wyles D, Pockros P, Morelli G, et al. Ledipasvir-sofosbuvir plus ribavirin for patients with genotype 1 hepatitis C virus previously treated in clinical trials of sofosbuvir regimens. Hepatology. 2015;61(6):1793–1797. Lawitz E, Flamm S, Yang JC, et al. Retreatment of patients who failed 8 or 12 weeks of ledipasvir/sofosbuvir-based regimens with ledipasvir/sofosbuvir for 24 weeks. Presented at: Program and abstracts of the 50th Annual Meeting of the European Association for the Study of the Liver; Vienna, Austria; April 22–26; 2015. Abstract O005. Naggie S, Cooper C, Saag M, et al. Ledipasvir and sofosbuvir for HCV in patients coinfected with HIV-1. N Engl J Med. 2015;373:705–713. Saab S, Park SH, Mizokami M, et al. Safety and efficacy of ledipasvir/sofosbuvir for the treatment of genotype 1 hepatitis C in subjects aged 65 years or older. Hepatology. 2016;63(4):1112–1119. Wilder JM, Jeffers LJ, Ravendhran N, et al. Safety and efficacy of ledipasvir-sofosbuvir in black patients with hepatitis C virus infection: A retrospective analysis of phase 3 data. Hepatology. 2016;63(2):437–444. Alqahtani SA, Afdhal N, Zeuzem S, et al. Safety and tolerability of ledipasvir/sofosbuvir with and without ribavirin in patients with chronic hepatitis C virus genotype 1 infection: Analysis of phase III ION trials. Hepatology. 2015;62:25–30. (EASL) TEAftSotL. Recommendations on treatment of hepatitis C 2015. J Hepatol. 2015;63(1):199–236.